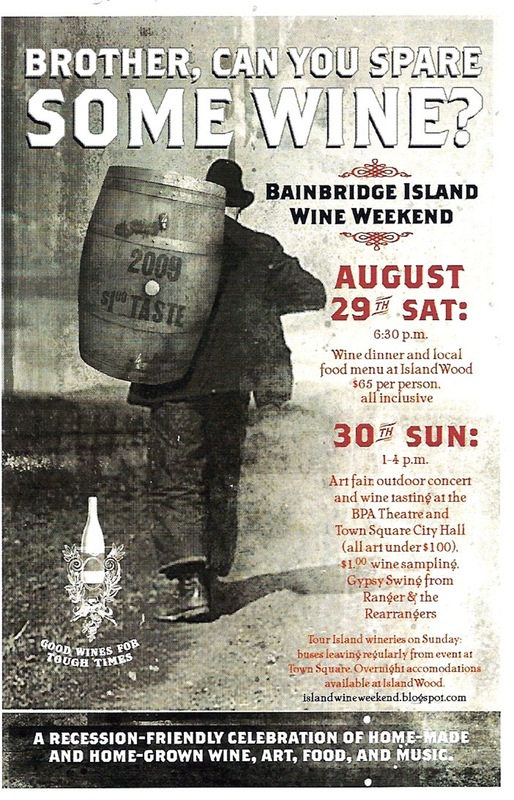 This weekend Bainbridge Island is hosting it’s first “Wine Weekend”. The event kicks off Friday August 28th and runs through Sunday the 30th. Wine Weekend offers a great opportunity to increase your learning curve on the merits of Puget Sound AVA wines and taste local small boutique, garagiste’ artisan crafted wines. Two of the wineries pouring wines at the event specialize solely in the unique wine grape varietals grown on the West side of the Cascade mountains. Strange sounding grapes with names like Muller Thurgau, Siegerrebe and Madeleine Angevine will be available for tasting. Here is a list of the wineries that will be open for touring and pourings! Offering 100% Bainbridge Island estate-grown European-style wines including Muller-Thurgau, Siegerrebe, Medaliene Angevine, Pinot Noir, and Pinot Gris. A tiny, family owned & operated vineyard and winery featuring local varietal Muller-Thurgau & Madeleine Angevine. If lucky winemaker Mike may be pouring the first local commercially bottled Melon de Bourgeon and don’t miss the Ichigo a strawberry port-style dessert wine made from strawberries grown on the Island. Artisan crafted small production wines including a spectacular Chardonnay/Voignier blend, Cabernet Sauvignon, Syrah and Bordeaux style blends. A boutique winery that has recently opened a tasting room downtown Bainbridge. Eleven features an expanding list of specially crafted wines including La Primavera (dry rose’) Pinot Gris, Sauvignon Blanc, Syrah, Malbec and I think the Islands only Petit Verdot. Specializes in producing quality, rich and full bodied red wines. Their Battle Point Red – will be Fletcher Bay’s first licensed release February 2010! A small, artisan, winery situated just north of Agate Pass Bridge in Kitsap County, Washington. Founder, Dave Prigmore, spent 12 years as one of the top Sommeliers at Seattle’s Metropolitan Grill. He studied the art of winemaking under Mike Januik & Jerry Bookwalter. The winery currently produces 1000 cases a year. Current production features Merlot and Syrah. Winemaker Alphonse deKlerk got his start helping a vineyard in the Loire Valley in France harvesting wine grapes. Now he produces award winning wines on Bainbridge Island. Boutique, small scale productions of around 500 cases a year include blends of Chardonnay/Pinot Gris and a Cabernet Sauvignon/Merlot blend. A passion for wine inspired this artisan winemaker. Small scale quality crafted wines include a 2007 Pinot Noir, 2007 Semillon and a 2007 Sangiovese. Charlie Merrill owner and winemaker has also recently opened up an inviting tasting room downtown Winslow. The ferry ride will be well worth the trip. These wineries are rarely open at the same time and most are by appointment only. The wineries will be open all three days from 1-4pm. On Sunday, In addition to the wine tent tasting downtown Winslow shuttles between the wineries will be available and running every 1/2 hour. This will be a great weekend to get out and taste some local wine!